The National Weather Service is predicting another cold front will hit our area Thursday evening. By Friday morning we may have snow accumulating. By Saturday, winds may kick up. Because we are expecting wind combined with the freezing temperatures we anticipate power outages. Please take today and tomorrow to prepare. Stop by the pharmacy and pick up any necessary medications. Restock groceries for your family and pets, be sure to include foods that do not require heat. Make sure flashlights are accessible and replace batteries. Have fresh drinking water on hand. Tomorrow, Thursday, is forecast to be clear and sunny. Take the time to inspect your pipes, wrap them if necessary. You may want to leave your faucets turned on at a trickle. Know where your water shut-offs are in case of a burst pipe. If your pipes burst, you will not have water to flush toilets, so you may want to store additional water in buckets. If you lose electricity, limit how often you open your refrigerator and/or freezer in order to keep the food inside cold. If you are without electricity for an extended period of time, you may need to use or throw away some foods. For more information check out www.foodsafety.gov/keep/emergency/index.html for a handy guide on when to keep and when to toss foods. Public works teams are responsible for ensuring reservation owned roads are safe. If there is a safety hazard, please report it to the Tulalip Police Department 360-716-4608. Snohomish County is responsible for Marine Drive, although in emergent situations, like our last snow storm, Public Works will clear the most dangerous sections of road in order to assist with public safety. Although staff will be deployed to check on medically vulnerable adults, we encourage families to stay in touch with one another. If you know someone who may need assistance, please have them contact emergency management to see if they qualify for help, 360-716-4006, or adanielson@tulaliptribes-nsn.gov. If at any time you are worried about the health or wellbeing of an individual, please contact the Tulalip Police Department for a welfare check. 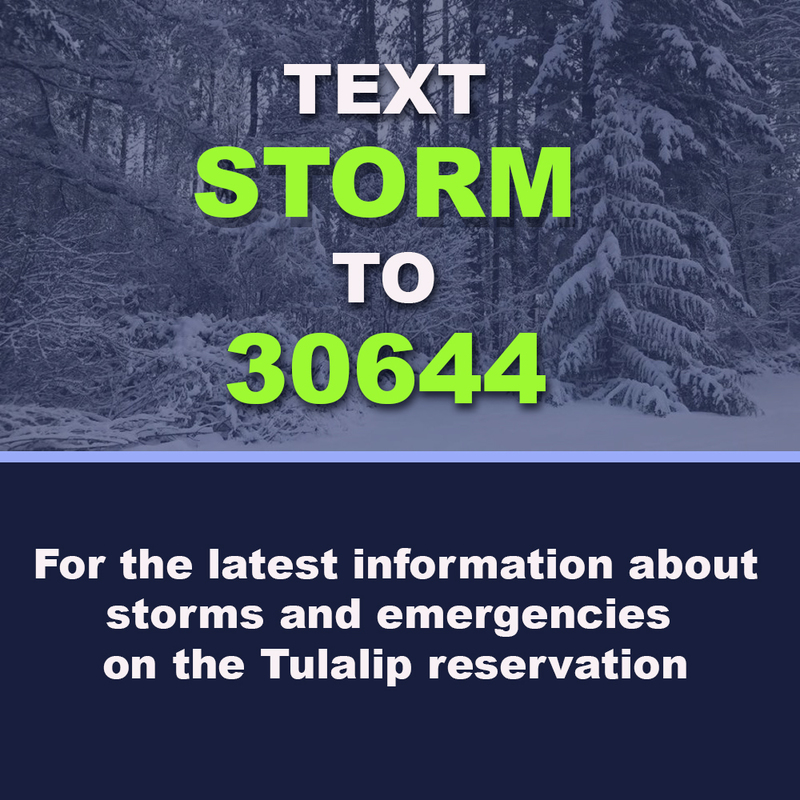 Be sure to check in with Tulalip News Facebook for the latest information and notification about closures and text STORM to 30644 for text alerts. In the meantime, please stay safe, warm and remember, you are the help before the help arrives!